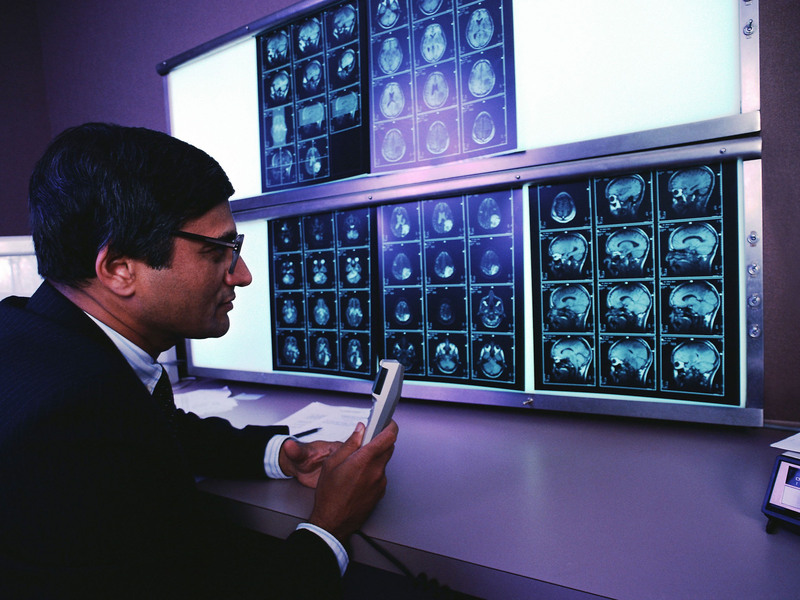 Researcher reading MRI scans of a developing human brain. One of the frontiers of neuroscience—the study of the brain and nervous system—continues to be the attempt to understand the “under-construction” teen brain, especially as it relates to the search for the roots of mental health problems. It is a puzzle of human development that teenage humans, who are near their lifelong peak of physical strength and mental capacity, have brains that are not fully developed. (To which a snarky vice principal, or parent, might chime in, “No, duh.”) Because the teen brain is undergoing so much change beneath the surface, researchers study the processes involved in its maturation to find clues about psychological disorders such as schizophrenia and depression that have their onset in early adulthood. Advances in knowledge are gradual, and brain scientists admit that there is much they don’t know about the links between the dramatic changes in brain structure and their impact on mental health. Aided by magnetic resonance imaging (MRI) technology, a British team has made an important contribution to our understanding. Researchers monitoring the brain structure of around 300 young people aged 14 to 24 discovered that (1) levels of myelin increase within the cortex, or “gray matter,” as the outer regions of the brain are known, at this critical stage of development, and that (2) the cortex itself is becoming thinner at the same time. Gray matter is made up of cell bodies of neurons, the nerve fibers that project from them, and other support cells. Myelin is the “insulation” that covers the nerve fibers, enabling them to communicate. Myelin exists mostly in the brain’s “white matter”—the connecting tissue between regions of the brain that permits communication. But it now has been found to occur within the cortex, and especially in what are called “association cortical areas,” the information hubs between different regions of the brain’s network. So, why does all this matter matter? One significant aspect of these results is that the timeline of human brain development, in terms of the volume of gray matter, is now pushed further into adolescence and young adulthood. That is, a teenager’s still-developing brain only begins resembling that of an adult after she or he is no longer a teen—in the early 20s. The scans show different functional areas of the brain developing at variable rates, with those areas that are in charge of impulse control and planning ahead being some of the last to completely mature. And the changes in the brain’s networking and communication hubs (the myelin increase and gray matter thinning) appear to coincide with the age at which mental health problems have their onset.